Mickey Rooney as HUCKLEBERRY FINN (MGM 1939) aboard his raft with the FLORA belching black smoke and barreling downstream on the Sacramento River.
. . . The story takes place between about 1880 and 1930, in a Caribbean seaport city, unnamed but said to be a composite of Cartagena and Barranquilla - as well, perhaps, as cities of the spirit less officially mapped. though his secular fate is with the River Company of the Caribbean and its small fleet of paddle-wheel steamboats. As a young apprentice telegrapher he meets and falls forever in love with Fermina Daza, a "beautiful adolescent with . . . almond-shaped eyes," who walks with a "natural haughtiness . . . her doe's gait making her seem immune to gravity." Though they exchange hardly a hundred words face to face, they carry on a passionate and secret affair entirely by way of letters and telegrams, even after the girl's father has found out and taken her away on an extended "journey of forgetting." But when she returns, Fermina rejects the lovesick young man after all, and eventually meets and marries instead Dr. Juvenal Urbino who, like the hero of a 19th-century novel, is well born, a sharp dresser, somewhat stuck on himself but a terrific catch nonetheless.
. . . There comes a moment, early in his career at the River Company of the Caribbean when Florentino Ariza, unable to write even a simple commercial letter without some kind of romantic poetry creeping in, is discussing the problem with his uncle Leo XII, who owns the company. It's no use, the young man protests - "Love is the only thing that interests me." "The trouble," his uncle replies, "is that without river navigation, there is no love." For Florentino this happens to be literally true: the shape of his life is defined by two momentous river voyages, half a century apart. On the first he made his decision to return and live forever in the city of Fermina Daza, to persevere in his love for as long as it might take. On the second, through a desolate landscape, he journeys into love and against time, with Fermina, at last, by his side. There is nothing I have read quite like this astonishing final chapter, symphonic, sure in its dynamics and tempo, moving like a riverboat too, its author and pilot, with a lifetime's experience steering us unerringly among hazards of skepticism and mercy, on this river we all know, without whose navigation there is no love and against whose flow the effort to return is never worth a less honorable name than remembrance—at the very best it results in works that can even return our worn souls to us, among which most certainly belongs "Love in the Time of Cholera," this shining and heartbreaking novel. Warner Bros. 1955 "Duke" Wayne adventure movie Blood Alley filmed on the Sacramento River aboard the old snag boat PUTAH which was called the "Chicu San" in the movie. John Wayne was not the first choice for Captain Wilder. Ahead of him in line were Robert Mitchum, Humphrey Bogart and Gregory Peck who dropped out for various reasons. "A merchant marine captain, rescued from the Chinese Communists by locals is shanghaied by them into transporting the whole village to Hong Kong on an ancient paddle steamer." 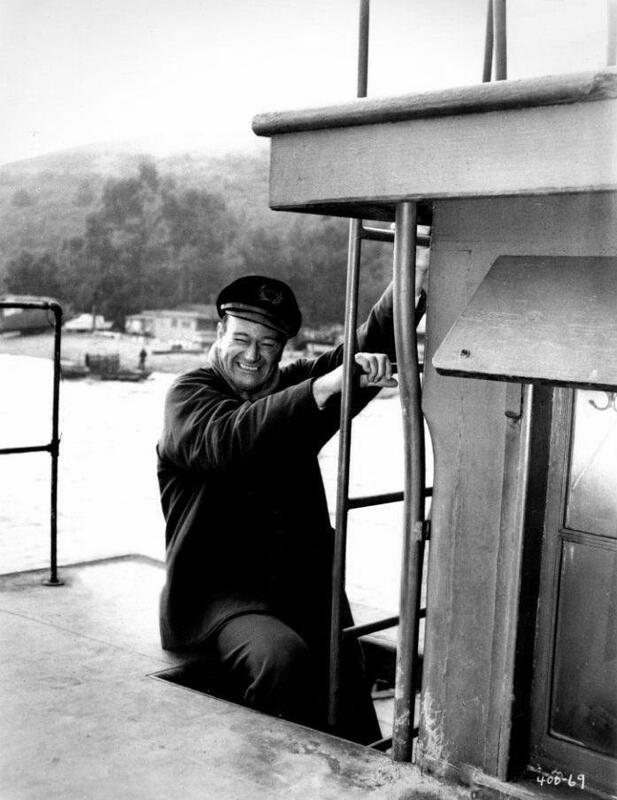 John Wayne as Cap'n Wilder is about to climb the secured ladder on the pilot house aboard the snag boat PUTAH which was renamed for the "Chicu San" in the 1955 Warner Bros. adventure film BLOOD ALLEY. The Duke had a special fondness for boats and ships. Aboard the BELLE OF LOUISVILLE I saw a photograph of Wayne visiting the pilot house of the BELLE. Out here on the West Coast the Duke owned and sailed a yacht named the WILD GOOSE that was converted from a WW2 Navy Minesweeper. 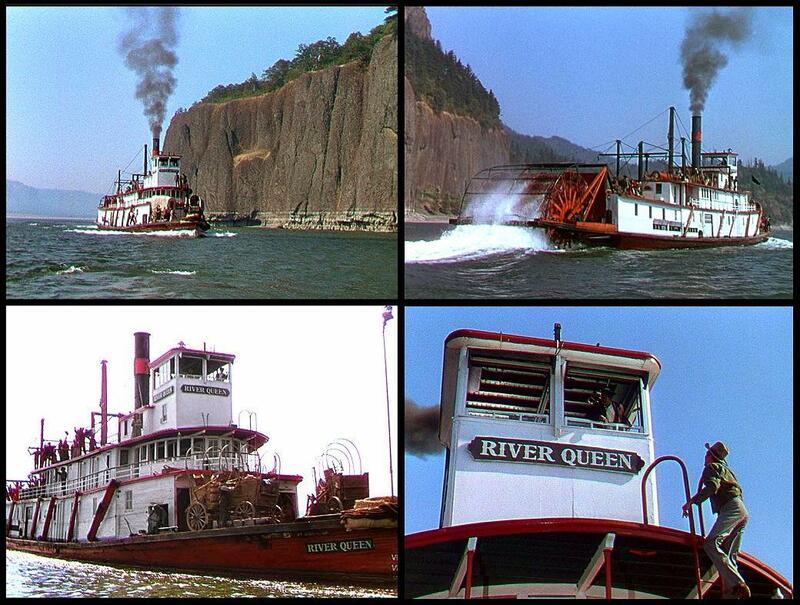 Attached four screen captures from the DVD of "Bend of the River" a 1952 Western starring James Stewart filmed in part on location in Washington State and Oregon along the Columbia River. 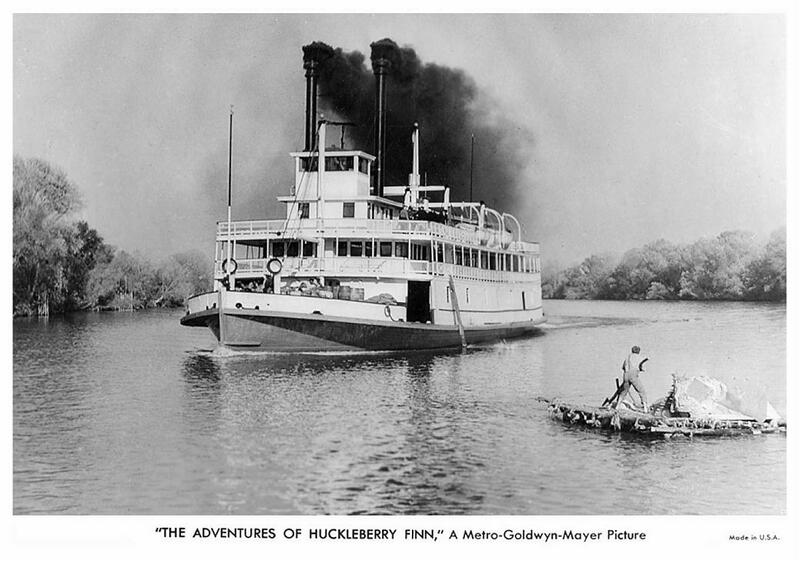 The steamboat with the almost inevitable name "RIVER QUEEN" was played by the towboat HENDERSON (1901-1956). "... The last steamboat race on the Columbia was held in 1952, between the HENDERSON and the new steel-hulled PORTLAND, both towboats. This was actually more of an exhibition than a race. The famous actor James Stewart and other members of the cast of the recently-filmed movie Bend of the River were on-board the HENDERSON. The race was witnessed by Capt. Homer T. Shaver, who stated that as both were running fast for their design, as towboats, the speeds were not much compared to what he'd seen as a young man on the river. ..."
Source: Gordon Newell, (ed. ), 1966, H.W. McCurdy Marine History of the Pacific Northwest, Superior Publishing, Seattle. The HENDERSON won the race but blew a gasket doing it. Pilot house scene from the 1952 Universal Western Bend of the River. Filmed on the Columbia River aboard the towboat HENDERSON as the "River Queen." It marked the return of Stepin Fetchit to another steamboat on location (he had played "Noah" in Steamboat Round the Bend on the Sacramento River seventeen years earlier. "It was, however, a stirring sight as the two paddlers, smoke pouring from their stacks and stately waterfalls at their sterns, re-enacted the glory days of steamboating on the Columbia. And this time the sentimental favorite, the old wooden Henderson, beat the new steel Portland." For some reason the crew with camera, lights and microphone "boom" in the lower part of the frame are over-exposed compared to the upper portion of the picture with the distant steamboat, actors and covered wagon. 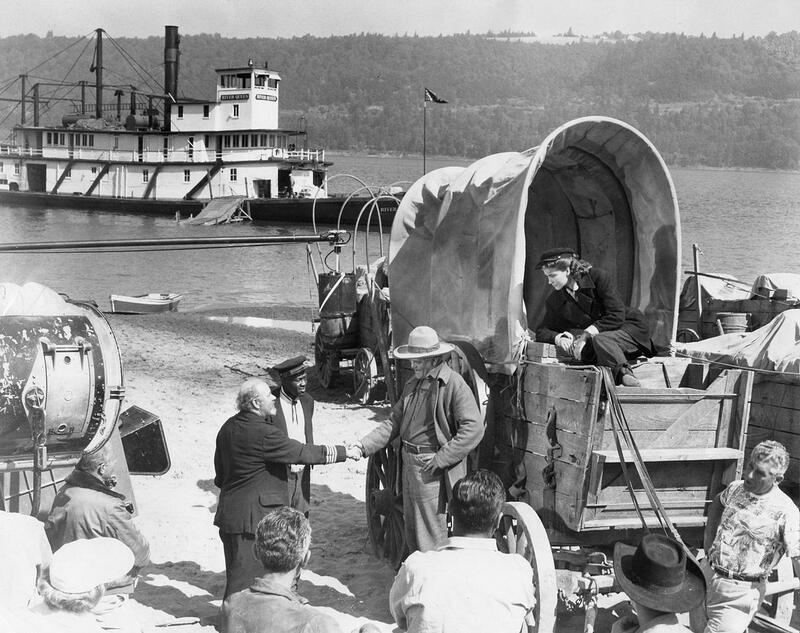 Making movies on a Columbia River beach at Rooster Rock are leads in "Bend of the River" supported by veteran sternwheeler HENDERSON, renamed "River Queen" for the picture. 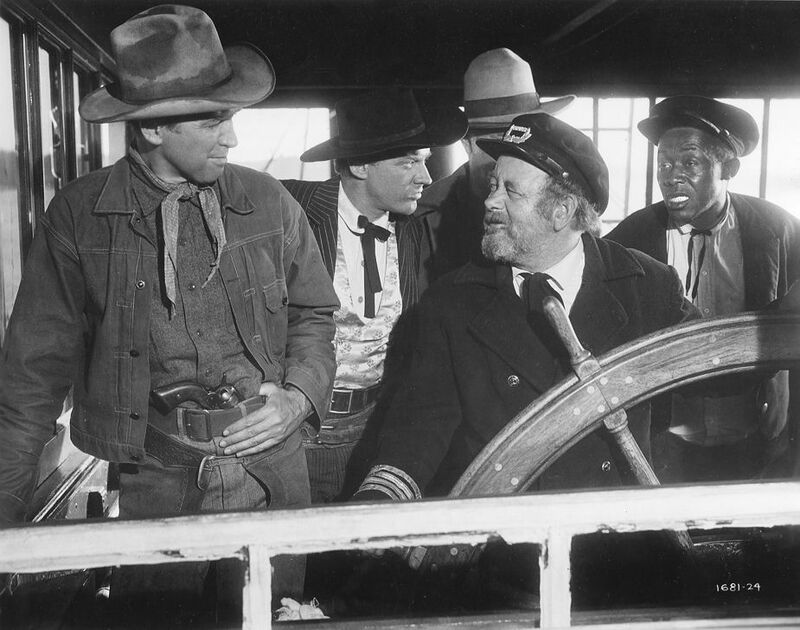 Shown here are Chubby Johnson as Cap'n Mello and Stepin Fetchit as mate Adam, saying goodbye to J.C. Flippen as wagon train leader Jeremy Baile, and Julia Adams as his daughter Laura. In Colt .45 (also known as The Colt Cousins) Christopher Colt posed as a gun salesman but was in fact a government agent tracking down notorious bad guys. Back on March 5th I saw the wonderful and charming 1954 Ealing Studios movie called THE MAGGIE for the first time. In the USA the movie was first released under the title HIGH AND DRY. The Clyde puffer is essentially a type of stumpy little cargo steamboat which provided a vital supply link around the west coast and Hebrides islands of Scotland. Characteristically these boats had bluff bows, crew's quarters with table and cooking stove in the foc'sle, and a single mast with derrick in front of the large hold, aft of which the funnel and ship's wheel stood above the engine room while the captain had a small cabin in the stern. When publication of the Vital Spark stories began in 1905 the ship's wheel was still in the open, but later a wheelhouse was added aft of the funnel giving the puffers their distinctive image. Their flat bottom allowed them to beach and unload at low tide, essential to supply remote settlements without suitable piers. Typical cargoes could include coal and furniture, with farm produce and gravel sometimes being brought back. 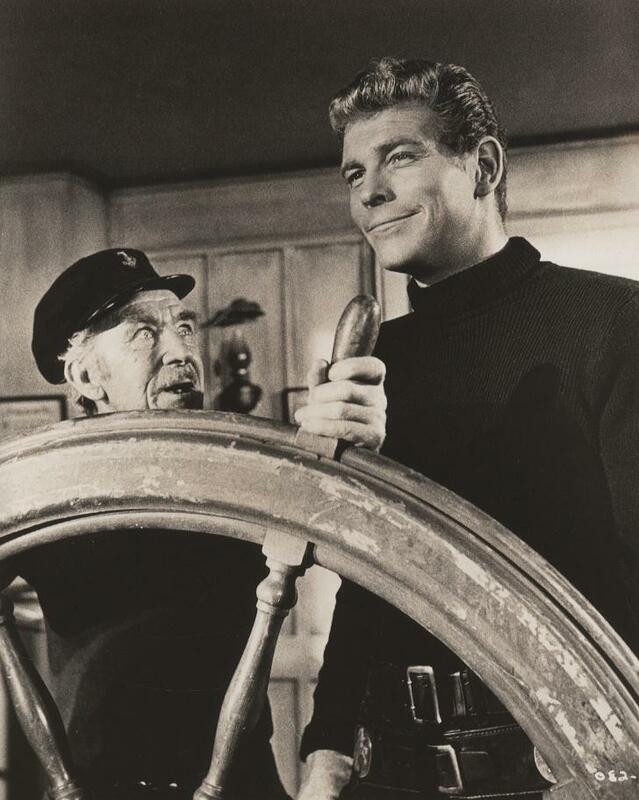 Alex Mackenzie who plays Captain MacTaggert in THE MAGGIE was a Glasgow native and for years taught school before becoming a professional actor His performance is artless, as if they had pulled him man right off a puffer. Tommy Kearins as cabin boy referred to as "The Wee Lad" steals the show in both comedy and drama, with an unscrubbed Huck Finn quality. 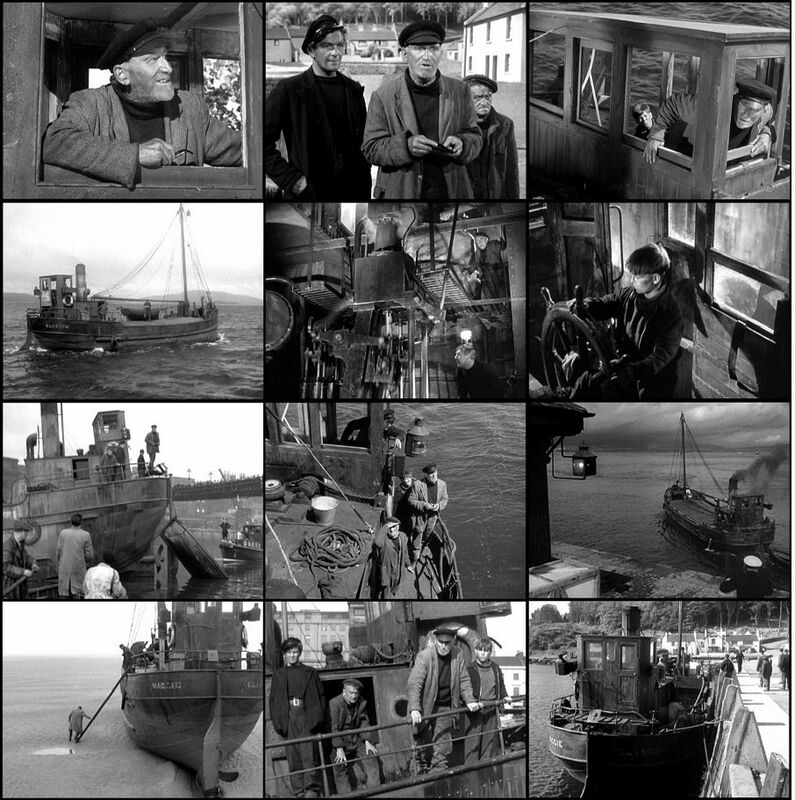 I pulled the attached 12 favorite frames off the DVD which evoke the flavor or the shabby boat with Cap'n and crew to match. Only online video from the movie sets up the story with a case of mistaken identity when the man in the bowler hat goes to see the MAGGIE, which MacTaggart has volunteered to haul valuable cargo for an American tycoon. EVER since "Tight Little Island" came along five years ago with a warm and delightful commentary on the single-mindedness and shrewdness of the Scots, We have been waiting for that film's director, Alexander Mackendrick, to cut loose again with another appreciation of the people he knows and loves so well. Blessed be Mr. Mackendrick and the canniness of the Scots. Blessed be Michael Balcon and his Ealing Studios. For the smooth combination of all these factors that is represented in this film has resulted in a jolly entertainment that is as bracing as the Hebridean air. 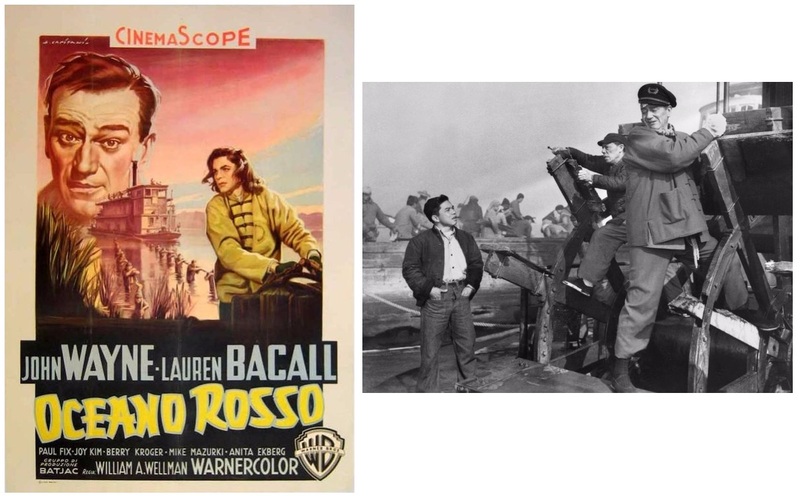 This time, Mr. Mackendrick, working from a story of his own that has been put together into a screenplay by William Rose, is concerned with a mighty contention between a bang-bang American business man and the crew of a wheezy Scottish "puffer" that fetches cargoes among the Hebrides. If this sounds a cheerless complication, you should make the acquaintance of Captain MacTaggert, the skipper of the Maggie, and his two-man-and-one-boy crew. And you should contemplate Calvin B. Marshall, the loud-mouthed Yankee tycoon, who makes the mistake of presuming that he can outsmart these single-minded Scots. The blather and bluster of this gentleman when he finds a particularly precious load of his household furnishings consigned to the Maggie's uncertain hold crashes in a spray of salty humor against the craggy and saturnine Scots, who are determined to deliver the cargo and collect the freightage that will save their beloved tub. And the devilish devices of the captain to outwit the brash American have a nippy and cheerful Scottish flavor. He must make Bellabegwinnie or bust! When he is stranding the Maggie atop the subway in the River Clyde or jailing a character for poaching along the banks of an inland waterway, he is gushing unbeatable comedy. And his tap on the heart strings at the end, is sufficient to round off his characters. Alex Mackenzie as the skipper is a wonderfully shrewd and stringy sort—a thoroughly unbeatable old pirate—a Scottish Barry Fitzgerald. Paul Douglas as the blustering Yankee is the perfectly full-blown buffoon. James Copeland, Abe Barker and Tommy Kearins are gorgeous as the Maggie's roguish crew especially that little Tommy Kearins with his Scots burr and soup-bowl hair-do. Hubert Gregg does some lovely clowning as a breathless, befuddled British "Clark." Also, we cannot fail to mention the tangy atmosphere of Scottish seaports, canals and white stone hamlets that hang at the edge of heathered moors. As in "Tight Little Island," Mr. Mackendrick has stuck to the real outdoors for the better part of his picture, and you can feel it, all the way through. It is downright intoxicating. And "The Maggie" is a hearty, wholesome film. THE MAGGIE, screen play by William Rose; from an original story by Alexander Mackendrick; directed by Mr. Mackendrick; produced by Michael Truman; an Ealing studios-Michael Balcon production presented by the J. Arthur Rank Organization and released by Universal-International. At the Sutton. 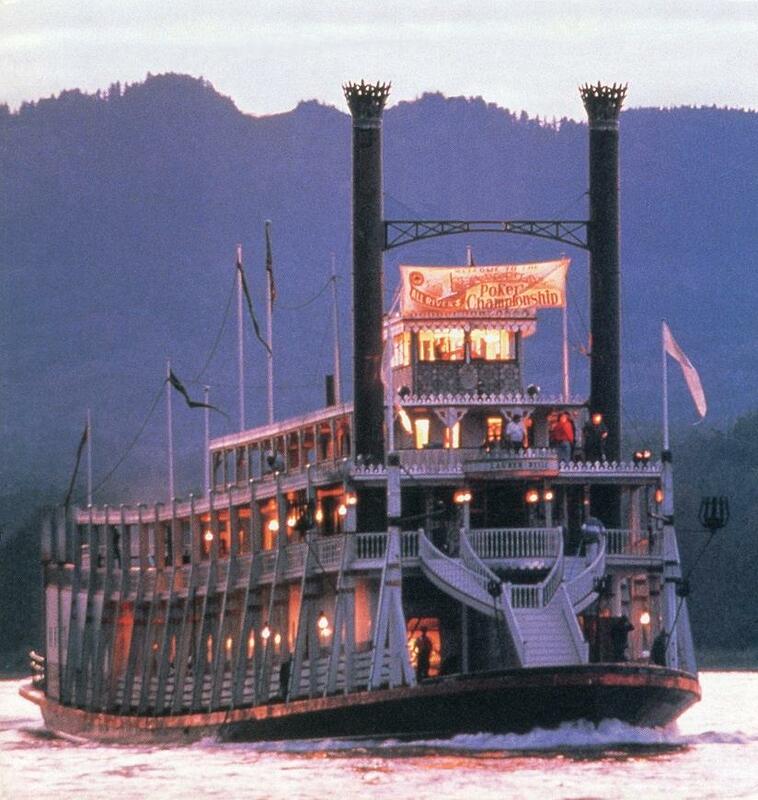 Image of the steamboat PORTLAND "revamped" as the LAUREN BELLE to resemble a Mississippi style steamboat for the 1994 Mel Gibson Western/Comedy MAVERICK based on the popular 1950's TV series. This is from the cover of a Japanese program promoting the movie. To make her look more authentic I used Photoshop techniques to erase the PORTLAND's tall smokestack aft of the pilot house and left the twin stacks (put there for the movie, then removed afterwards) which were intended to give her more of the appearance of an authentic Mississippi River steamboat. The Oregon Maritime Museum's steam sternwheeler Portland is moored at the Willamette River in downtown Portland's Waterfront Park. 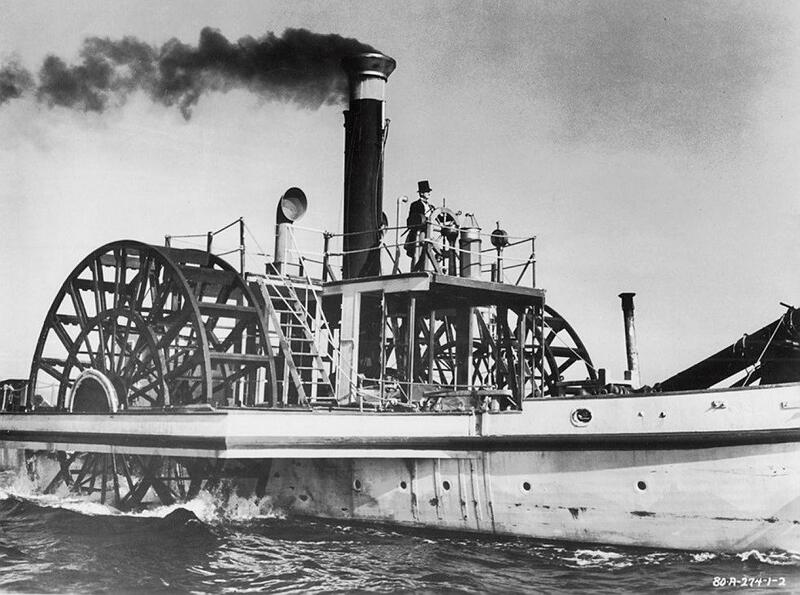 The Portland is the last steam-powered, sternwheel tugboat to be built in the United States. The Port of Portland took delivery on August 29, 1947 and she immediately went into service. The Portland assisted ships to dock, turn and pass through the narrow bridge spans on the Willamette River. Her massive rudders and backing power were essential for moving loaded ocean-going ships. When you visit the steamer Portland today, you see the result of more than a million dollars worth of volunteer labor over 15 years to restore the steamer Portland. The deckhouse is rebuilt, and new systems are installed. The boat comes alive again when the sternwheel rotates and the sound of the whistle fills the valley! The Portland is the last operating sternwheel steam towboat in the United States. 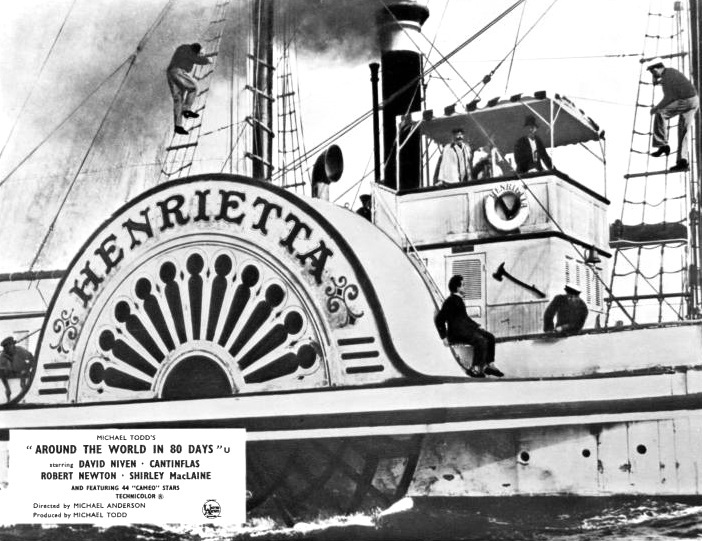 By way of clarifying how the ocean going sidewheeler HENRIETTA looked before she was stripped down to the hull to fuel the boilers I located the attached lobby card from AROUND THE WORLD in 80 DAYS for you to put above the 8 x 10 movie still of the bare bones boat. In Michael Todd's 1956 movie adaptation of Jules Verne's 1873 novel AROUND THE WORLD IN 80 DAYS the novel's hero Phileas Fogg is on the last leg of his crossing from the East coast of the United States to reach England across the Atlantic Ocean on the steamer HENRIETTA in order to get back to England in time to win his wager that he could indeed travel around the world in 80 days. A shortage of fuel aboard the HENRIETTA and apparently not enough wind to depend on the sails the boat was rigged with, required a drastic strategy on Fogg's part to keep up steam. He bought the HENRIETTA from her Captain and ordered that the wooden superstructure be dismantled to feed the fires under the boilers in order to keep up steam to reach the coast of England. 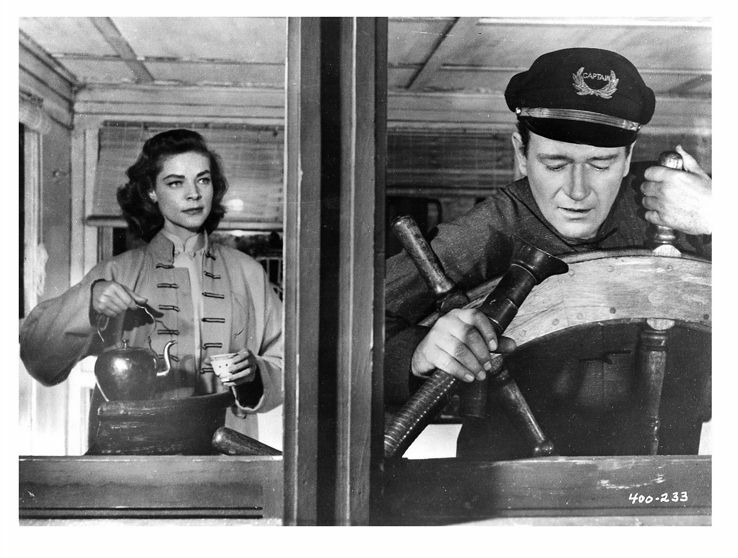 Attached a lobby card of the HENRIETTA prior to her dismantling and an 8 x 10 still of David Niven at the helm of the HENRIETTA after the boat had been stripped of its wooden superstructure to keep the fires burning. 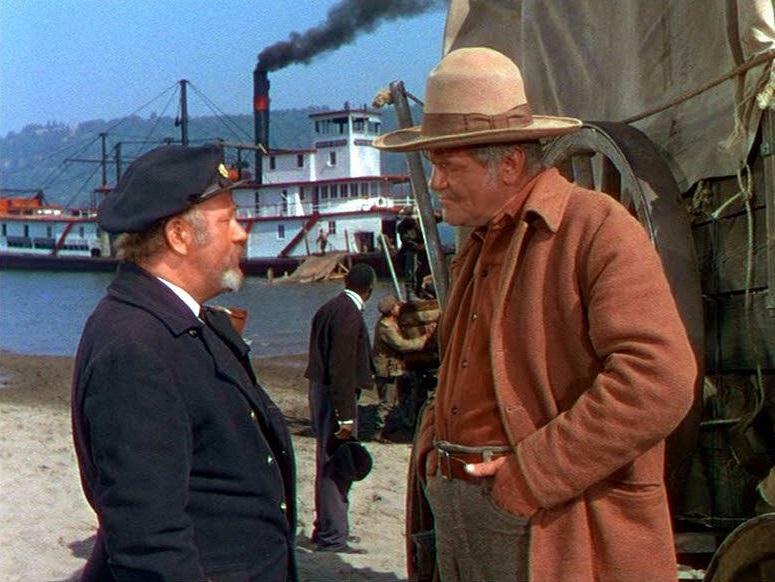 Will Rogers as Dr. John Pearly in STEAMBOAT ROUND THE BEND used the same method that Fogg employed to fuel the CLAREMORE QUEEN when she ran out of firewood during the last leg of the race against Irvin S. Cobb's (Cap'n Eli's) steamer the PRIDE OF PADUCAH. Dr. John gave his crew orders to chop up and burn the wooden decks and to also incinerate the waxwork figures in his "Floating Museum;" then finally the remaining stock of the alcohol-laced Pocahantas remedy in order to beat Cap'n Eli to Memphis and save Dr. John's nephew Duke from the gallows with in-person testimony from The New Moses, the only eye witness who could confirm that Duke killed the engineer Big Steve in self defense. Below is abridged text of Chapter 33 from Project Gutenberg's online English translation of Verne's novel that encapsulates the saga of the Henrietta. "I have sent for you, sir," said Phileas Fogg to Captain Speedy "to ask you to sell me your vessel." 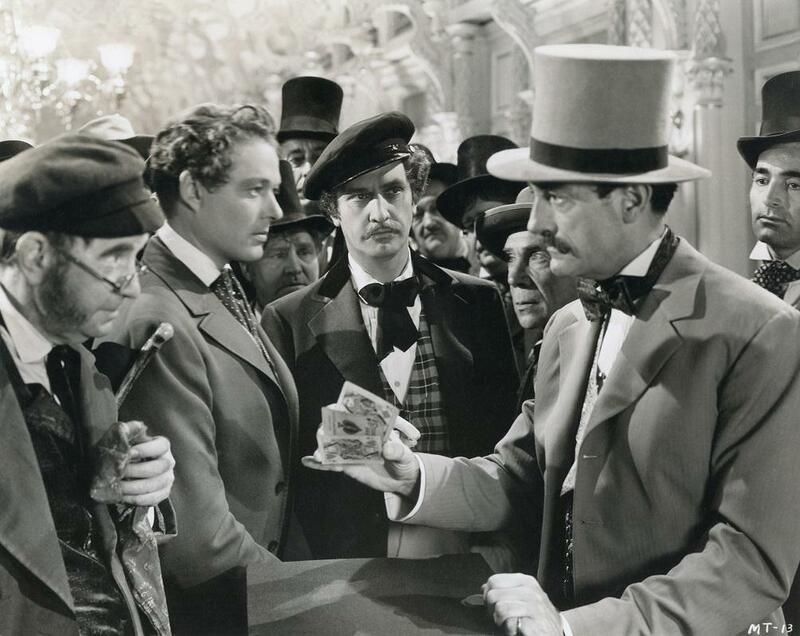 "Here are sixty thousand," replied Phileas Fogg, handing the captain a roll of bank-bills. This had a prodigious effect on Andrew Speedy. An American can scarcely remain unmoved at the sight of sixty thousand dollars. The captain forgot all his grudges against his passenger. The Henrietta was twenty years old; it was a great bargain. "And I shall still have the iron hull," said the captain in a softer tone. Mr. Fogg said, "The vessel now belongs to me?" "Certainly, from the keel to the truck of the masts—all the wood, that is." It was necessary to have dry wood to keep the steam up to the adequate pressure, and on that day the poop, cabins, bunks, and the spare deck were sacrificed. Passepartout hewed, cut, and sawed away with all his might. There was a perfect rage for demolition. The railings, fittings, the greater part of the deck, and top sides disappeared on the 20th, and the Henrietta was now only a flat hulk. 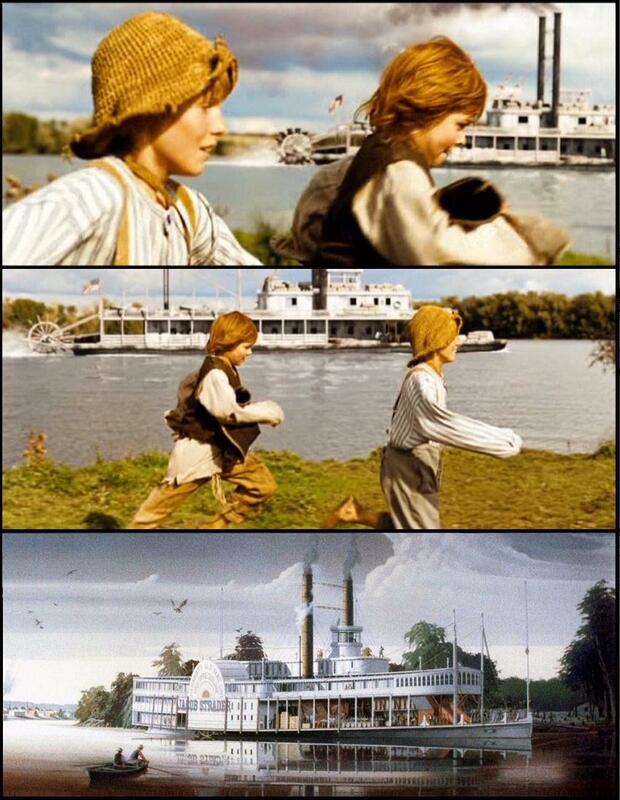 Attached two screen captures from the opening scene of the 2011 German motion picture production of TOM SAWYER with Tom (in straw hat) and Huck running a "foot race" against each other and a sternwheel steamboat in the distance on the Danube doubling for the Mississippi. The steamboat must have been created digitally, wholly or in part to achieve the action. Steamboats with smokestacks "aft" of the pilot house were the exception rather than the rule on the early boats that plied the Mississippi River and its tributaries. Many years ago Fred Way published a black and white photo of Robert Hagemann's amazing painting of the JACOB STRADER 1853-1866 in the REFLECTOR quarterly. I was able to contact Bob Hagemann and he kindly sent me a color slide of his painting that I scanned and finessed into the bottom image under the photos of Tom and Huck "racing" the distant boat. 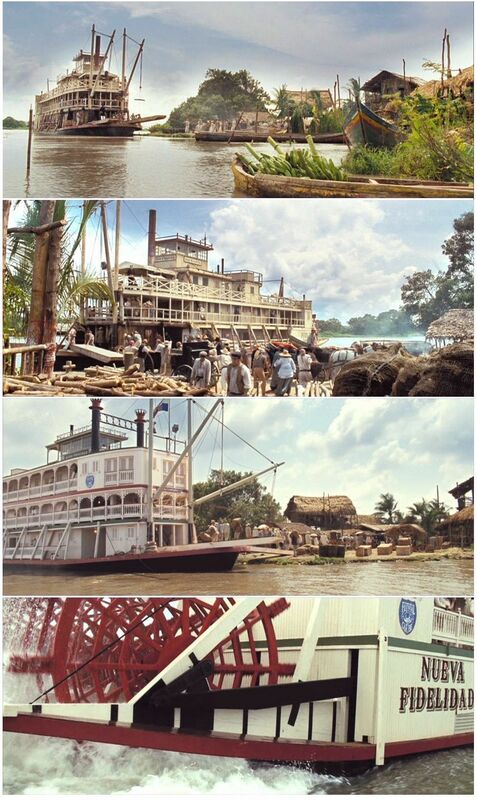 Of course the STRADER was a sidewheeler rather than the sternwheeler in the Tom Sawyer movie but otherwise the position of the stacks is about the same. The STRADER had a cylindrical pilot house which was likewise out of the ordinary, the one in the movie has a conventional "box" shape. Seven screen captures from the English dubbed U.S. release on DVD of the 2012 German film adaptation of Mark Twain's The Adventures of Huck Finn ("Die Abenteuer des Huck Finn") a sequel to "Die Abenteur des Tom Sawyer" made a year earlier with quite a few of the same cast members. Christian Steyer portrays Mark Twain. 2 frames of the actor in make up are in the upper left and upper right on this composite of 9 frames including the Main Title. The Danube River in Romania doubles for the Mississippi River. The sternwheeler in the six frames was apparently remodeled from a 20th century Danube barge or freighter. Instead of being "amidships" the pilot house on the hurricane roof it is situated at the stern of the boat. In most of the old American sternwheelers the "water closets" (toilets) were located at the stern so the paddlewheels could do the "flushing." It's rather ironic here that the pilot house is by implication also the "outhouse" on this boat. The plot of the movie diverges considerably from Mark Twain's novel. After escaping from his crazy "Pap" Huck and the runaway slave Jim are pursued by not only Pap but by some slave hunters who in the novel were three criminals that Huck and Jim had seen aboard the wreck of the steamboat "Walter Scott." 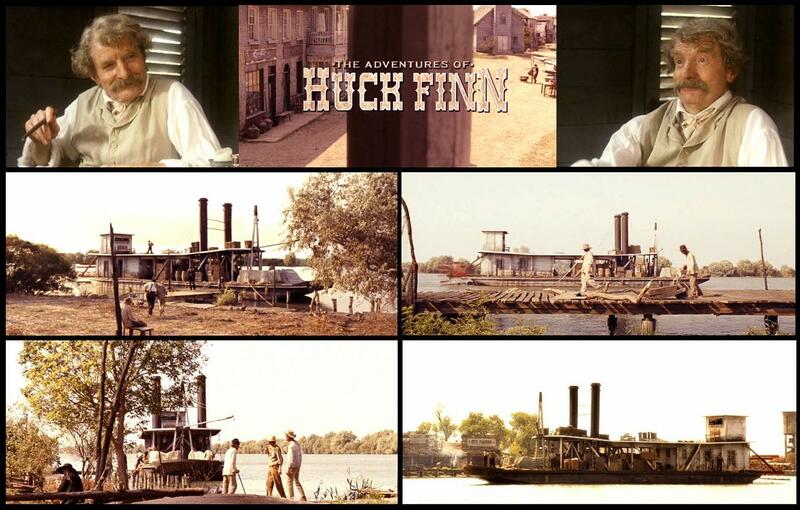 At the end of the movie Jim is shot by one of the slave hunters while he is escaping from them and Huck helps the injured Jim get aboard this steamboat where Mark Twain just happens to be a passenger. Twain is not only a writer in this movie, he's also a surgeon and able to extract the bullet from Jim. An epilogue says that Jim escapes up the Ohio River, gets a job and is able to save enough money to buy his wife and children who are slaves in the South. The movie is heavy on crude humor (especially flatulence and noisy bowel movements) and violence which includes the "Dauphin" hitting the "Duke" in the face with his fist at the least provocation. The majority of the adult white males are coarse racist rednecks and the only two sympathetic white males are Becky's father Judge Thatcher and Mark Twain who is anachronistically middle aged as if he had been somehow teleported to the 1840's from the 1880's where Huck volunteers to tell Clemens all about his adventures that had preceded this closing sequence on the steamboat where Clemens/Twain doctors Jim and gets him on the path to recovery. This English dubbed, U.S.A. formatted DVD is available on eBay from the_nile_usa. Elaborate cabin interior set on a Warner Bros. soundstage of the fictional steamboat QUEEN OF DIXIE circa 1860/61. At center wearing a cap with shiny visor and a plaid vest is Frederic March as Samuel Clemens, steamboat pilot. To the left of March is Bill Henry as Charles Langdon, brother of Olivia Langdon, who would eventually marry Clemens in 1870. Clemens would not actually meet Charles until 1867 aboard the trans-Atlantic steamer QUAKER CITY en route to Europe and the Holy Land. The smooth character raising the cards in the right foreground is Harry Worth as a Gambler. Langdon (commenting to a Pickpocket about the gambler's obvious swindle: "Incredible, permitting themselves to be robbed like this." Between Clemens and the Gambler is Ernie Adams as the Pickpocket who steals Langdon's wallet and other possessions. Clemens witnesses the theft and gets Langdon's property back from the thief. The boat's Bouncer approaches and asks "Can I help you Mr. Clemens?" Clemens - "Too bad we haven't got a cure for this fellow's manners, maybe drowning will help." Bouncer (taking the culprit away) - "All right, cast off." Have not yet identified the actor in the foreground on the left who is playing the Gambler's "mark."